My tiny human made a Valentine’s Day picture and put it on the fridge. I ate it. Posted February 14th, 2014 . Nothing says lovin’ like something for the tummy! 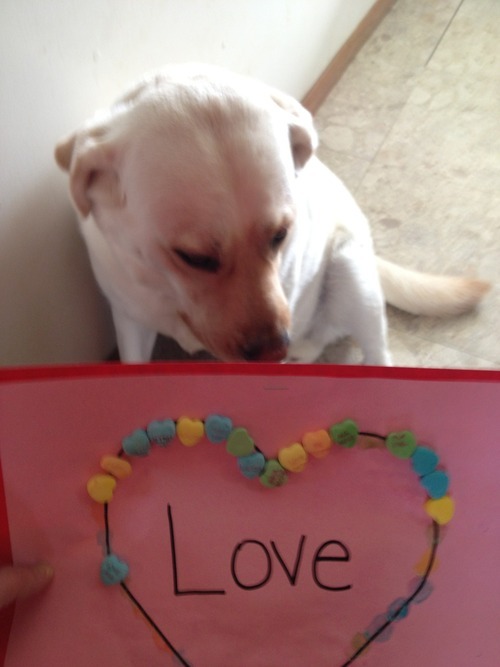 Oh dear, puppy looks sorry:( Happy Valentines day! But it looks so delicious! Of course you did. She couldn’t have made it for anyone else. Not with that sweet face. Silly Humans, food goes bad if it sits out. He just wanted to make sure the food didn’t spoil. Puppy looks so sorry! And there’s *some* left on the paper…. My puppy would have destroyed the art work as well as eating the candies. Your puppy was VERY gentle and must have known how important it was. I do see the look of shame!